Startled as I was. I looked back at my cards and said in a low voice to the boys: “Don’t look up or appear to notice it, but someone is on the veranda; I just saw the screen door open a trifle”. Nonsense said Rudy. “It’s only the wind”. “But no wind is blowing it’s too sultry”. Then again, that ghostly opening of the door and back of it the outline of a man. So I said in a still lower voice “I see a man peering in. Uncle Dickies revolver is in his top bureau drawer. Gerry, you run up and get it and Rudy and I will keep on playing cards as though we had noticed nothing”. Gerry arose, saying nonchalantly, “It’s my turn to get the drinks tonight” and sauntered unconcernedly out of the room. Rudy and I sat there, not daring to look up lest we spoil the neat little game we had planned, waiting for Gerry to come back. But why didn’t he come? What had happened? We never suspected that revolver in hand, he had run quickly down the backstairs, out the back door, and tiptoed stealthily along the veranda to the front of the house. The first we heard was Gerry’s voice ringing out “Damm you! Hold up your hands or I will shoot”. He had taken the eavesdropper by surprise. Rudy and I stood spellbound during the scuffle in the dark that followed. It was punctuated by muttered growls, the thud of heavy bodies then a silence that seemed interminable, and at least three quick shots. Far out in the darkness an agonized scream. Then dead silence. We both rushed to the window shrieking, “Gerry, Gerry are you killed”? NO answer. Like a flash Rudy bounded up the stairs shouting, there’s a shotgun in your mother’s room. I flew after him at equal speed. Mother who had retired early was lying in the darkness when Rudy burst in shouting “Gerry’s been killed” where is the shotgun? While mother fumbled for candles we had no electricity at Foxlair Rudy seized the gun and was off. I was hanging on his coat tails. “Don’t do it Rudy”. I was screaming. “You’ll be disfigured for life. Remember you belong to the screen the public”. Followed another scuffle in the dark, this one between Rudy and me, which ended with both of us flying out the front door into the night. When some 10 minutes later we returned, mud-bedraggled still toting our gun, we found Gerry standing in the living room, so thoroughly drenched and mud-encrusted that only the whites of his eyes and his teeth shone through the clay mask to identify him. He was administering first aid to mother, who a moment earlier, had entered the living room with her candle and mistaking Gerry for the miscreant had screamed for help and fainted. And now the story came out as much of it as we ever learned. Gerry on the veranda, had seized picked himself up, ran after the man and shot at him blind three times just like that. The station master at North Creek told us, when we made an inquiry that a stranger had left by the early morning train, a man who was in evident pain and walked with two canes holding one foot from the ground. He was well dressed, tall, young and good looking. He had driven up in a Ford car with another stranger, bought a ticket for New York and boarded the train, while his companion drove quickly away. One heavenly summer morning we sorrowfully bade goodbye to the beautiful mountains of Fox Lair. The trouble awaited us in New York was far worse that we had feared. Rudy suddenly found himself involved in a colossal litigation against the wealthiest, most powerful organization in the motion picture industry. Its giant tentacles were so far ramifying, its influence so widespread that Rudy, in his efforts, to combat them, was helpless as a lone swimmer in mid-ocean with every current and wind against him. His fight made cinema history. Other screen actors since motion pictures began had their tiffs and bouts with producers. These were mere children’s quarrels in comparison, in which the children were spanked and made to behave. 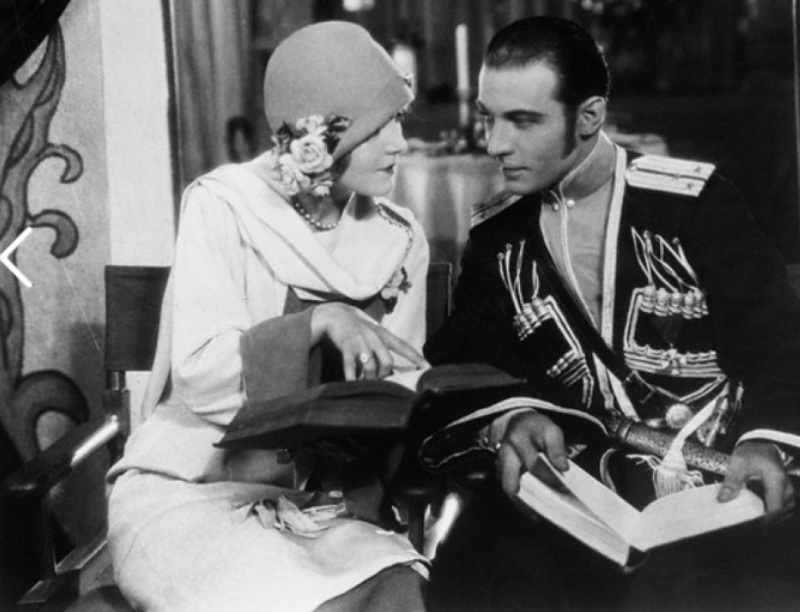 Rudolph Valentino was a world famous star, the popular idol of two continents, with a gigantic following of fans, enormous pulling power at the box office. All the facts involved were so startling, the punishment he had to take was so severe, that the case, at the time, blazed in newspapers over the entire world, in headlines line those a few years ago, had announced victory or defeat in a war zone. But this was back in 1922 and 1923 the world very quickly forgets. I will briefly review the highlights. As soon as we perceived that the case could not be dismissed in a day, or a month, or a year, we made the best arrangements we could for a protracted stay in New York. Since mother and Uncle Dicky (Richard Hudnut) could no longer postpone their trip to Europe, we wired my aunt, Mrs. Werner always out first aid in trouble, to come on from the coast to be our chaperon. Mother and Uncle Dickie sailed off on the Olympic one morning wishing us good luck, which we needed and early the same evening auntie arrived from the coast. I must tell you about my beloved aunt Mrs. Theresa Werner. The world is familiar with her name because Rudy remembered her in his will. He loved her as much as I did even more, he used to tell me. As no other woman in the world could have done, she took the place of his own mother. Her home was in Salt Lake City, Utah but she often visited us in California and was one of those rare people who could be the third in a household without having the other two cordially wish she wasn’t. Auntie was never there when we didn’t want her and always there when we did, the most tactful, kindest, and most thoroughly adorable woman who ever lived. And how delighted we both were to see her. Auntie and I setup housekeeping in an attractive apartment on West 67th Street, while Rudy moved to the Hotel des Artistes to share an apartment with his friend, Frank Menillo. Gerry, exhausted by his long-term of service as companion and ex-officio chaperon, had by this time fled back to Hollywood. Under these arrangements both Rudy and I could have a taste of home life and still comply with the rule for “separate residences”until the long year should pass and we could be remarried. The first part of our litigations with Famous Players was very unfortunate. Our case was inadequately handled painfully so, we learned by that time it was too late to make amends. The facts which had made the real breach between Rudy and his producers were not even mentioned in the affidavit which our lawyer drew up. Famous Players promised Rudy first, that if he would finish “The Young Rajah” in Hollywood even though I had to fly to New York, that he might make his other pictures in the east, where we could be together. Second, that he might have the privilege of choosing his own director, his own pictures, in the future. None of these promises had been kept, which constituted Rudy’s case against them. But these important facts were not mentioned in the papers our lawyer drew up. The only points stressed in the case he made were ridiculous, petty annoyances, and complaints that Rudy did not have a dressing room of his own and between shots he had to sit on a stump in the sun: that he bawled out before the extras and prop boys in the studios other things that belittled him in the eyes of the court and the public.. What man in his sanity would go to court for petty grievances like these? Why a so-called lawyer should be so little interested in winning his case was something neither Rudy nor I could understand until later. As a result, Famous Players-Laskey were granted a complete injunction against Rudy, one of the most paralyzing injunctions ever issued by an American court. It barred him from production of any kind, not only on the screen and stage but from any kind of work whereby he might earn a legitimate livelihood. By the terms of this injunction he couldn’t even sweep the streets for a dime, drive a taxicab, or pull weeds in anyones garden nothing whereby he might support himself. And our finances in their usual precarious condition. Of course, this violated the personal liberty of a citizen of the U.S. so it was quickly modified. Yet, even so, it was bad enough. I, myself could have supported us both quite easily by dancing in vaudeville. Many offers of this kind were made but always when I found came to accept them I found there suddenly and mysteriously withdrawn. We checked on every side. Fortunately, a friend in need, Joe Godsol, then president of Metro came to our rescue. What we would have done without is generosity and kindness, I scarcely dare think. The help he gave us was entirely free from any security on Rudy’s part indeed, we had none to offer. Joe did not even ask interest on his loan nor accept it when offered. This unselfish proof of friendship will never be forgotten. Although the monetary debt was paid immediately the injunction was modified to permit Rudy to work, yet there are some debts money cannot pay. Our debt to Joe is one of these. Rudy’s case against Famous Players-Lasky finally settled after long litigations was significant in this respect. Now everything became suddenly quite different. On the Famous Players-Lasky lot in Hollywood every star had his or her special dressing room; private bungalows sprung up like mushrooms everything was done to make their work agreeable as possible. This sudden right-about-face in this treatment of actors was very amusing to us who had a sense of humor likewise gratifying. This radical change in attitude extended to all other organizations in the industry. But all this is a little ahead of my story. In his litigation with Famous Players-Lasky things continued to go badly until Rudy and I changed lawyers and secured Max Steuer to handle our case.